"It's nice, but it sure would look better as a rally car" was pretty much our take on the 2015 Skoda Fabia. Lo and behold, Skoda took our advice and suited up its Volkswagen Polo-based subcompact for rally duty. With zebra stripes! 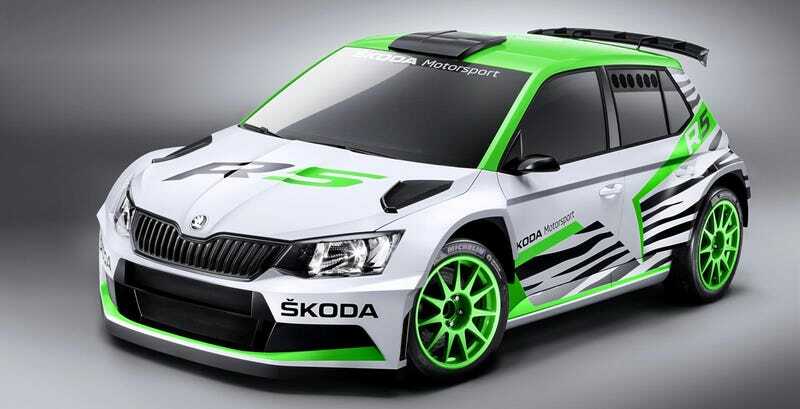 This is the Skoda Fabia R5, and at the moment it's just being called a concept. However, Skoda said they expect to get the actual car homologated by the middle of next year. Like all FIA cars it has a 1.6-liter turbo engine, mated to a sequential five-speed gearbox. Weight will be at least 2,700 pounds in keeping with regulations. Skoda, secretly the Volkswagen Group's best brand, had a strong rally showing in this most recent season, and the new car looks poised to continue that streak. And the zebra stripes are a nice addition to their typical green and white livery.